Turntables are useful for providing directional change in your conveying line. A section of conveyor is attached to the table service and is then rotated to the desired position. Turntables are used for loading and A valuable accessory for ergonomic work stations or for confined working areas. 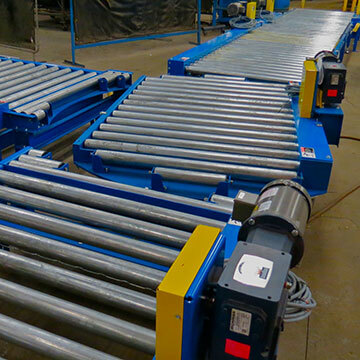 Turntables are used for palletizing, depalletizing, assembly and painting… the possibilities are endless! Turntables can be powered or manually operated and have standard swing diameters up to 120 inches. Manual positioning stops unloading pallets and containers, as well as, improving the ergonomics of workstations.